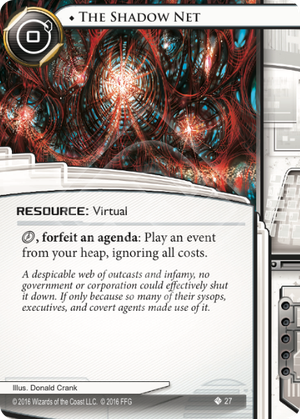 click, forfeit an agenda: Play an event from your heap, ignoring all costs. A despicable web of outcasts and infamy, no government or corporation could effectively shut it down. If only because so many of their sysops, executives, and covert agents made use of it. Can the Runner use The Shadow Net to play a priority event? No. The first click would have been spent to use The Shadow Net instead of on playing the priority event. Sure Gamble as in "Wow, that's as good as Data Dealer!" Probably more of a bonus than anything else though. Account Siphon because it's the game's best event. High-Stakes Job probably not as strong as the other two, the biggest 'normal' event you can discount and situationally powerfull. Brute-Force-Hack will get it derezzed again for the measly price of one of your precious agandae. Trade-In and Scavenge are the last two events with unconventional costs I could think of. Unfortunately you'll no longer get the discounts they would normally give. If there are any other notable cards I'll add them to the list. Unfortunately, I'm not sure that Fisk Investment Seminar works, otherwise that might be a legitimate mill strategy.